California Interfaith Power & Light is glad to help spread the word that clean, renewable solar energy is now available to families that wouldn’t otherwise be able to afford it. In this special webinar you will learn how you how you and your congregation can help bring no-to-low cost power to families in need. The Solar Power for All Referral Campaign is a partnership between nonprofit GRID Alternatives and Interfaith Power & Light (IPL). GRID Alternatives’ Solar Affordable Housing program helps homeowners save up to 75% on their electric bills while providing a source of clean, local energy that benefits the whole community. GRID Alternatives leverages donations, rebates and incentives, and a barn-raising model where communities come together to install the systems. This makes solar affordable or even free for families in need. Register here. This event will feature CIPL staff Allis Druffel, videos and group discussion on best ways to implement the prohetic call contained in Pope Francis’ powerful encyclical on ecology. An Action Team formed from this event will gather on Tuesday, April 12, at 7:00pm to discuss practical implementation strategies of Monday’s group discussion. In Pope Francis’ recent encyclical on ecology, Laudato si’, and sacred to many major world religions, the principle of the inter-connectedness of all life is of primary importance. We are all intimately dependent on the “web of life” in every single everyday action. Come to the “The Blessing of All Life” event on April 17. Celebrate with us and affirm this connection! The event will include interfaith prayers by leaders of several different faith traditions, and a special blessing on you and any living thing, animal or plant that you bring with you. Contact: Allis Druffel – (310) 752-3436; allis@interfaithpower.org. ALL ARE WELCOME- TELL A FRIEND! 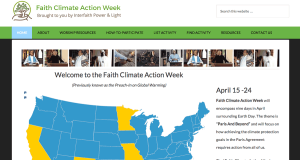 Visit the site at FaithClimateActionWeek.org for listings in your state! Join the San Diego faith community on Friday, April 15 as we celebrate the sustainability work happening in our region. World-renown climate scientist Dr. Veerabhadran Ramanathan of Scripps Institute, will be presenting his ground-breaking climate change research, his role in the Vatican’s Pontifical Academy of Sciences, and his influential presence at the U.N. Climate Talks in Paris. An inspiring video of climate action from the San Diego community will be shown, rounded up by a “Faith and Climate” tabling expo providing practical resources on how to make a more sustainable future possible. Sponsored by California Interfaith Power & Light and Simpler Living, St. Paul’s Episcopal Cathedral. 7:30pm – program with Dr. Ramanathan, video and tabling expo – free. Join us at Skyline Community Church for a wonderful celebration of dance, music, and food! Bring food to share, casual clothes, a musical instrument, and your joyful spirit! For more information, check out the church's website. Learn about the ‘whole-house’ concept of energy efficiency and comfort at this workshop. • Maximize the efficiency of your lighting and appliances. • Qualify for rebates for appliances. • Reduce energy waste and your carbon footprint. Bonus! You will receive a free advanced LED light bulb at the workshop. Don’t miss out on our freshly baked cookies and other healthy snacks! Please go to https://sancarlos.stepupandpowerdown.com/events/ to RSVP and to view our other events in the area. California is a beautiful state blessed with remarkable weather. However, due to global warming, our weather is changing, with devastating effects. We need to take action to slow this process. The Contra Costa chapter of Citizen’s Climate Lobby (CCL) is hosting a presentation by Dana Nuccitelli that powerfully addresses this important issue. Dana holds a B.A. in Astrophysics from UC Berkeley and an M.S. in Physics from UC Davis. He is a well-known climate blogger and writes for the UK’s Guardian and works with CCL. His relaxed presentation style and sense of humor will make for an entertaining and informative evening. The San Francisco Bicycle Coalition, Walk San Francisco, San Francisco Interfaith Council and leaders from local CIPL member congregations are partnering to create Walk & Bike to Worship Week from Saturday, May 21 to Sunday, May 29. Throughout the week various congregations will celebrate walking, biking and taking transit to their place of worship. Congregations may sign up and choose which day they wish to participate and promote to members of their organization. We invite and encourage all places of worship to participate. When you sign up you will receive a free Walk & Bike to Worship toolkit to help with your event. Walk & Bike to Worship is an event that gives that gives your congregation and community members the opportunity to raise the visibility of walking, biking, and/or taking transit to worship to make communities safer and more pleasant places to live. Additionally, it’s a collective celebration that promotes physical activity, health, and safety for neighbors and the environment. What do you want the future to sound like? Listen. Then Act. 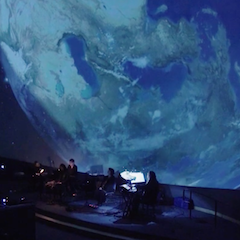 Join California Interfaith Power & Light for a performance of The ClimateMusic Project’s original work by composer Erik Ian Walker, “Climate,” which takes us through more than 500 years of the climate’s past, present and possible futures. The performance integrates science-inspired music with synchronized visuals that combine to add an accessible, visceral element to the underlying data. A post-concert panel discussion and public reception will cap this evening that is sure to move and inspire. With Erik Ian Walker on keyboards, Thomas Dimuzio on synthesizer and live sampling, Michele Walther on violin, Bill Noertker on bass guitar, Scott Brazieal on keyboards and live mixing by Angela Lee. On June 27, the Oakland City Council will finally decide what to do about coal. Will the City Council ban coal or will it sentence us to a 66-year-long compromise with the developer that would make Oakland the biggest coal exporting city on the West Coast? Join No Coal in Oakland on Saturday, June 25, for a large rally at City Hall starting at 1 p.m.
Environmental leadership means building trust and acting together. Israelis, Palestinians, Jordanians and students from around the globe emerge as friends and colleagues. David earned a joint Masters Degree in Management Science from Boston University and Ben Gurion University and has served as Director of the Arava Institute for Environmental Studies since 2001. David also founded the Green Kibbutz Association and the Alliance for Peace in the Middle East. For more information, please contact Tal Shaked at tshaked@jnf.org or 415.677.9600 x974. RSVP by July 7, 2016 to jaclyn.greenberg@jnf.org or 415.677.9600 x968. As our state enters summer 2016 with extreme heat, the threat of rolling blackouts and increasing wildfires, we at California Interfaith Power & Light are finding strength and hope in the enduring commitment of our member congregations, volunteers and visionary legislators like Senators Fran Pavley and Ricardo Lara. 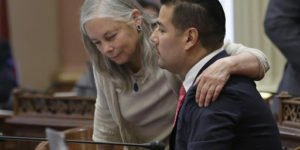 Senator Fran Pavley, who, as an Assembly Member, authored California’s landmark climate legislation, AB 32, has devoted her efforts to bills aimed at public health protection, renewable energy, and pollution reduction. AB 1493 and AB 32 are now models for other states and nations. In 2010 President Obama implemented national clean car standards, modeled on AB 1493 (Clean Car Regulations), also known as the "Pavley law." During a special ceremony in the White House Rose Garden, the president personally thanked Senator Pavley for her work on creating a clean, safe, secure energy future for California and the United States. Senator Ricardo Lara is a public health and environmental champion who is currently leading the effort to reduce super pollutants like methane, black carbon and fluorinated gases. Senator Lara authored both SB 673, which is helping our state to ensure that vulnerable communities are protected from hazardous waste, as well as SB 1204, which is financing zero and near-zero emission trucks, buses, and other vehicles to clean up the air we breathe. If you, your organization, house of worship or business would like to be a sponsor of CIPL's Climate Visionary Leadership Awards, please click here. Representatives of the three Abrahamic faiths will discuss each of their faith's views about protecting the Earth, caring for the environment and being proactive in combatting climate change, which many believe is Earth's biggest problem. Rev. Bingham will also describe the work of the Regeneration Project, which promotes renewable energy and conservation as part of Interfaith Power and Light, an interfaith climate change initiative. Participants will hear from green businesses based in Oakland and the East Bay, local officials, investors, faith leaders and more, and share input on how to bring more jobs and opportunity to our communities as we fight climate change. From clean tech to urban farming, green transportation to forestry, let’s build a local economy that works for everyone and protects the planet. Join Interfaith Power & Light's Founder & President, the Rev. Canon Sally Bingham at longtime California IPL member congregation, Grace Cathedral for a screening of Leonardo DiCaprio's new personal and passionate film on the climate crisis, "Before the Flood." The screening will take place from 4 p.m. - 6 p.m. in the Wilsey Conference Center in the lower level of cathedral. This film screening is one of many occurring in congregations across the nation in collaboration with the national Interfaith Power & Light campaign. The first ten attendees will receive a free signed copy of "Love God, Heal Earth"
Dinner and Screening of The Years of Living Dangerously, "Moving a Mountan", followed by a panel discussing various aspects of the climate crisis, including CIPL staff member Allis Druffel. Led by Senior Rabbi Zoe Klein. This is the first of three presentations at Temple Isaish, led by their Green Team. 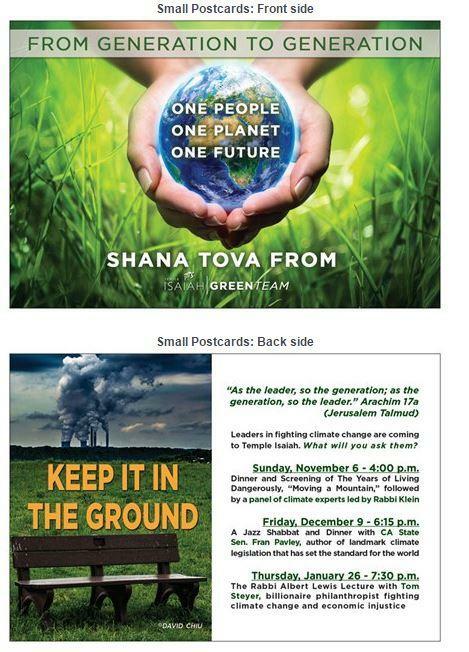 Subsequent events: Friday, December 9, 6:15pm - Jazz Shabbat and Dinner with Senator Fran Pavley; and Thursday, January 26, 7:30pm - presentation from Tom Steyer, philanthropist and climate champion. Contact Steve Fox for more information - MinuskSF@aol.com. Friends and allies of California IPL are organizing the following gathering on Tuesday, November 15th. Please consider attending. Additional events are being planned around California. When water is being threatened, sacred sites are desecrated, rubber bullets, tasers, bean bags, and pepper spray are fired, continued violations of treaties and human rights, protectors being jailed, media communications being jammed, it is time we stand together in the BAY AREA in solidarity with the peoples of Standing Rock Sioux Reservation, in North Dakota, and against the Dakota Access Pipeline. * Full Environmental Impact Statement must be completed. Please write and bring a letter, to the event, addressed to the Army Corps of Engineers with your concerns about denying a permit to bore under the Missouri River, the permitting process, an Environmental Impact Review, and the protection of sacred and historic cultural sites. Monday, November 14th: Call, Email, Write Letters! Tuesday 11/15: Spread the word and join us at 6:30am on this nationwide day of action. If you can join us in risking arrest taking nonviolent direct action, please attend an action training-orientation (times/locations will be posted soon) and please form or join an "affinity group" of friends/students/neighbors/family/co-workers/congregation/community to participate with you. Monday 11/14: Gather in community and hold letter-writing, emailing, and calling parties to the Army Corps of Engineers, White House, Funders of DAPL, local representatives, and DOJ. If you can't gather, mobilize yourself and friends to make these calls on Mon 11/14!! We need to support our protectors at Standing Rock - call to stop the violations by DAPL and militarized police to protectors, sacred sites, and indigneous people. They are close to the Missouri River!! Let's flood their offices! INDIGENOUS-LED PRAYERFUL ACTION. ABSOLUTELY NO DRUGS/ALCOHOL ALLOWED. Click here to learn more about CIPL's annual event celebrating California congregations making a difference in the struggle to address global warming as a moral issue. Nominate your congregation or sign up as a sponsor. Before the Flood presents a riveting account of the dramatic changes now occurring around the world due to climate change, as well as the actions we as individuals and as a society can take to prevent catastrophic disruption of life on our planet. The film follows DiCaprio as he travels to five continents and the Arctic speaking to scientists, world leaders, activists and local residents to gain a deeper understanding of this complex issue and investigate concrete solutions to the most pressing environmental challenge of our time." Moderating this event will be Susan Stephenson, Executive Director, the Regeneration Project, and Keith Casto, an energy and environmental attorney and member of the congregation, both of whom attended the Paris Conference.